Released to both controversy and acclaim in 1995, La Haine ranks among the most incendiary European films of the decade. Furious, funny, intelligent and tense, its treatment of racial violence, disenfranchisement and suburban poverty introduced audiences to aspects of French life rarely seen on film - specifically police brutality and Le Pen's National Front. In style and intent it occupies a position somewhere between Taxi Driver and Do The Right Thing. However writer-director Kassovitz's great triumph is the way he allies outright polemic with intensely powerful drama. In fact, so effective is his handling of the issues that the French Cabinet were reported to have watched the film in the hope that it would aid their understanding of the country's ethnically diverse young poor. Set in the 24 hours following a riot on a Parisian estate, the film follows three mates as they wander aimlessly through the city. Vinz (Cassel) is a Jewish Travis Bickle, boiling with anger. North African Saïd (Taghmaoui) is a personable loudmouth, keen to get himself laid. Black boxer Hubert (Koundé) is a more thoughtful presence and his frustration the most deeply buried. During the course of a day and night they ponder the death of an Arabic friend at the hands of the police, and stumble across a cop's lost pistol. La Haine is a film with a reputation for bleakness, and the final scene (it doesn't conclude - it just stops) is inescapably grim. So is a sequence in which the boys take a beating from the police, and the moment when Vinz has the chance to shoot a skinhead. But Kassovitz's writing is also loaded with wit, and long segments are full of anxious, comic energy. Atmospherically shot in black and white and infused with the sounds and style of French hip-hop, Kassovitz's direction has the urgent authenticity of documentary footage. He's also an effective stylist and uses Paris as a striking backdrop. With nowhere to go, the boys slope through deserted public spaces - empty streets, vacant trains, a shopping mall at four in the morning - locations that echo their own sense of estrangement. 'The world is yours' runs the slogan on an advertising billboard. Saïd gets his pen out and alters it to the bitterly ironic - or is it desperately hopeful? - 'The world is ours'. 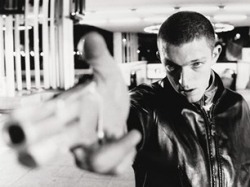 Powerfully but naturally acted, La Haine's great strength is that it is so fully engaged with the world it depicts. Vital and visceral yet sympathetic to its flawed protagonists, it's Kassovitz's own writing from the start of the film that best conveys his characters' rage at their impotence and isolation, and La Haine's own grimly fatalistic tone. "Heard about the guy who fell off a skyscraper?" asks Hubert. "On his way down past each floor, he kept saying, to reassure himself, 'so far so good... so far so good... so far so good.' How you fall doesn't matter. It's how you land."